Explorer is back. This week, National Geographic Channel announced the series will return in November with a new format. The new season of Explorer will take viewers to Indonesia, the United Kingdom, and the world’s first beer pipeline. New episodes debut on November 14th at 10 p.m. ET/PT. (LOS ANGELES/WASHINGTON, D.C. – September 27, 2016) – National Geographic Channel’s long-running, critically-acclaimed series EXPLORER, which has long represented the best of the network for more than three decades, will return in a newly reimagined format on November 14, 2016 at 10:00 pm ET/PT. Hosted by Richard Bacon (@richardpbacon), and taped in front of a live studio audience in a state-of-the-art studio in New York City, cable television’s longest-running documentary series will use a mix of intrepid field pieces, roundtable discussions and in-depth interviews in a continuation of the series’ legacy of pushing the boundaries of journalism. This new evolution of EXPLORER, produced by National Geographic Studios, will air on a weekly basis on National Geographic Channel around the world in 171 countries in 45 languages and in Spanish on Nat Geo Mundo. In each episode, studio host Richard Bacon will anchor segments and panel discussions as well as a mix of entertaining and hard-hitting investigative stories from all over the world by field correspondents including Bryan Christy (National Geographic Explorer, “Explorer: Warlords of Ivory”), Ryan Duffy (Vice, AOL/Huffington Post), Francesca Fiorentini (AJ+, Al Jazeera Media Network), Jena Friedman (“Daily Show with Jon Stewart”, “Late Show with David Letterman, Justin Hall (“Explorer: Battle for Virunga”), Billie Mintz (“Jesus Town, USA”), Tania Rashid (Current TV, Vice News), Tim Samuels (BBC Television) and Baratunde Thurston (“Daily Show with Trevor Noah”). · Indonesia’s remote Toraja people practice mysterious and elaborate funeral rituals, which Billie Mintz learns are actually the focal point of a surprisingly modern and lucrative cottage industry. · Host Richard Bacon digs into the old saying that “an army travels on its stomach,” by getting up close and personal with the history, development and technology behind the meals that feed American troops in combat. · Across the U.K., children are being interrogated at school about their personal beliefs and religious practices and, in some cases, being torn from their homes because the government believes they are being radicalized. Francesca Fiorentini investigates this counterterrorism strategy, known as “Prevent,” that is leading some critics to ask: Have we moved into the Orwellian realm of punishing thought crimes? · Jena Friedman visits the first pipeline in the world that will exclusively pump beer. The brainchild of Belgian beer baron Xavier Vanneste, owner of a 500-year-old brewery, this new technology will pipe beer directly from the brewery to the bottling plant and, in turn, help both the town and the environment by eliminating the beer trucks that were clogging the narrow streets. Leading EXPLORER behind the scenes is a creative team well-versed in studio shows that tackle timely topics on a global scaled, including executive producer Lou Wallach, formerly of The Colbert Report and The Talking Dead, and showrunners Nick McKinney and Meghan O’Hara – industry veterans who have produced several feature documentaries and were also the co-creators of The IFC Media Project. Launched in 1985, before there even was a National Geographic Channel, EXPLORER has encapsulated more than 2,000 films and has been honored with nearly 60 Emmys and hundreds of other awards. The series has taken viewers to more than 120 countries, opening a window on hidden parts of the world, unlocking mysteries both ancient and modern, and investigating stories of science, nature and culture. Emboldened by the highly-respected yellow border, the series’ hallmark is incredible inside access to some of the world’s most exclusive, dangerous or unbelievable people and places. What do you think? 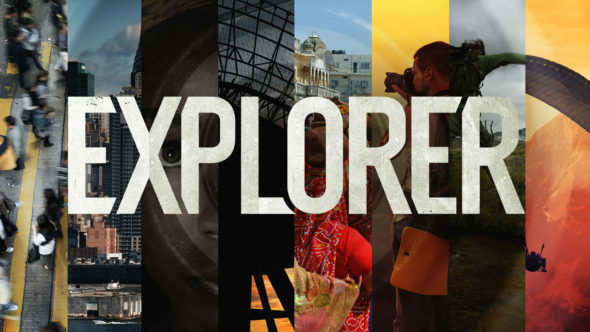 Are you a fan of National Geographic’s Explorer? Will you watch the new season? More about: Explorer, Explorer: canceled or renewed?, National Geographic Channel TV shows: canceled or renewed? The new format is horrible. I will definitely not watch this again. What happend to Explorer. This is awful! Bring back Coyote or Ling. This talk show format is terrible and the host is annoying. I was very excited about this show and the 1st episode I watched was the one about death and how different culture do funerals and while watching they showed a man taking a large knife and hitting the throat of a bull over and over and the show did not warn you that it was about to happen in that moment I stopped recording the series and will never watch it again.. they did not need to show that or at least should have put up a warning..